The American palm cixiid, Myndus crudus Van Duzee, is a planthopper whose adults feed on the foliage of various species of palms. 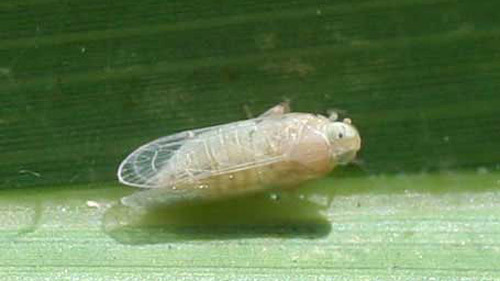 The nymphs of this species develop on roots of grasses. The adult is the only known insect vector of lethal yellowing (LY), a highly destructive disease of palms in Florida and various countries of the Caribbean Basin region. Figure 1. An adult American palm cixiid, Myndus crudus Van Duzee, resting on palm foliage. Photograph by F.W. Howard, University of Florida. Myndus crudus was described from Jamaica in 1907. It has been reported in and is native to southern Florida, Cuba, the Cayman Islands, Jamaica, Trinidad and mainland tropical America from Mexico and Central America through northern South America. It has not been reported in Puerto Rico, where the auchenorrhynchous fauna is well known, or on other islands of the eastern Caribbean, with the exception of Trinidad. It has been reported in almost all countries affected by LY (see Damage and Economic Importance), but its range extends far beyond the current geographical range of this disease. The auchenorrhynchous fauna of palms in the Bahamas is poorly known, but Myndus crudus may be presumed to be present there. In a survey of planthoppers and their taxonomic relatives on palms in the Dominican Republic (Hispaniola), Myndus crudus was not found, but a morphologically similar undescribed species was collected from coconut palms (Cocos nucifera L.). Identification of Myndus crudus adults in the field is facilitated by the fact that it is one of the few species within the superfamily Fulgoroidea and the only species of the family Cixiidae commonly found on palm foliage in southern Florida and the Caribbean region. 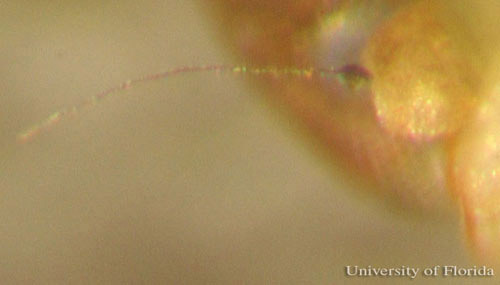 The antennae of Fulgoroidea species possess a barrel-like basal segment (scape) bearing a seta-like flagellum. Additional fulgoroid characteristics include the occurrence of spines of the hind legs in clusters at the ends of leg segments, rather than in rows along the tibia as in the family Cicadellidae, and three parallel carinae (elevated ridges) that divide the prothorax longitudinally. Figure 2. 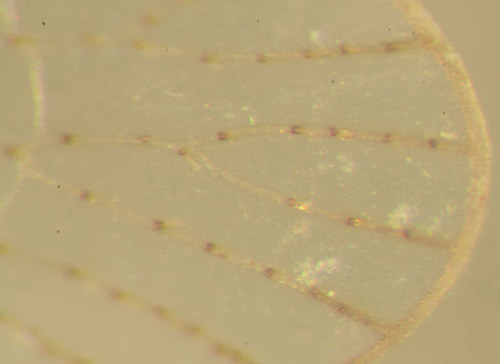 Antenna of American palm cixiid, Myndus crudus Van Duzee, showing barrel-like basal segment (scape) and seta-like arista. Photograph by F.W. Howard, University of Florida. Figure 3. Prothorax of American palm cixiid, Myndus crudus Van Duzee. Note the three carinae (elevated ridges) that divide the prothorax into four sections. Photograph by F.W. Howard, University of Florida. Figure 4. Close-up of hind leg of American palm cixiid, Myndus crudus Van Duzee. Note the tibial spines occurring in clusters. Photograph by F.W. Howard, University of Florida. The adult female of Myndus crudus at rest with posteriorly extended wings is about 5 mm long from the vertex of the head to the tip of the wing. The head and body are straw-colored. The frons is bordered on each side by a ridge (carina). The wings are transparent, with brown veins that have numerous pustules bearing setae. Figure 5. Close-up of distal part of wing of American palm cixiid, Myndus crudus Van Duzee. Note setae-bearing pustules on veins. Photograph by F.W. Howard, University of Florida. The prominent ovipositor distinguishes the female from the male. The male is slightly smaller and similarly straw-colored, but often paler, and the light green abdomen is more acutely tapered than that of the female. The eyes may have the straw color of the head and body, or a deep maroon color, depending on light conditions (see Biology). Figure 6. Adult female American palm cixiid, Myndus crudus Van Duzee. Photograph by F.W. Howard, University of Florida. Figure 7. 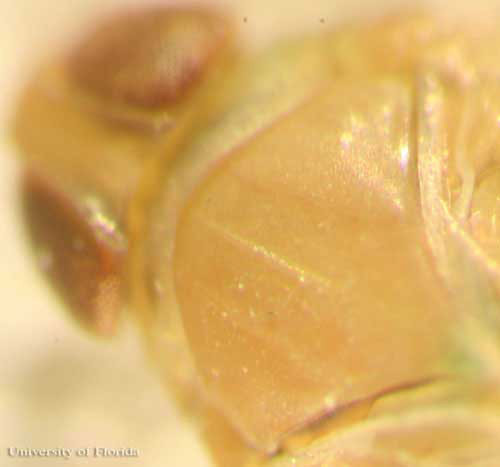 The abdomen of an adult female American palm cixiid, Myndus crudus Van Duzee. Note the dark ovipositor. Photograph by F.W. Howard, University of Florida. Figure 8. Adult male American palm cixiid, Myndus crudus Van Duzee. Photograph by F.W. Howard, University of Florida. Figure 9. An adult male American palm cixiid, Myndus crudus Van Duzee, resting on a glass so that the ventral surface of the insect is visible. Note the vivid green color and pronounced taper of the abdomen. Photograph by F.W. Howard, University of Florida. The nymphs are tan to gray in color, with a reddish blush on the head. The legs also are reddish, gradually brightening to red distally. Unlike in the adult, the maroon-colored eyes of the nymphs do not change with varying light intensity. 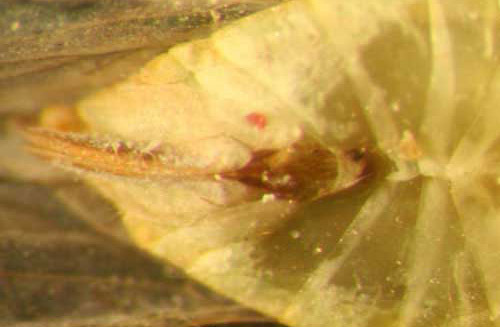 The nymphs are covered with a thin waxy bloom produced by numerous wax glands in the cuticle. The tibiae of the forelegs are flattened, a possible adaptation for digging beneath the soil surface. Figure 10. 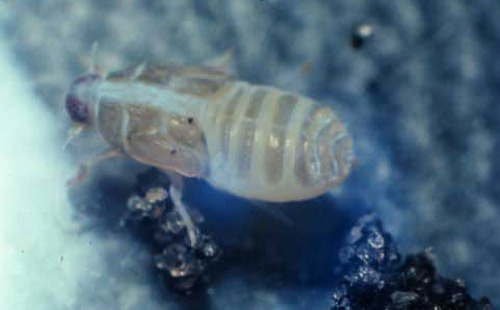 A nymph of American palm cixiid, Myndus crudus Van Duzee. Photograph by Jim DeFilippis, University of Florida. 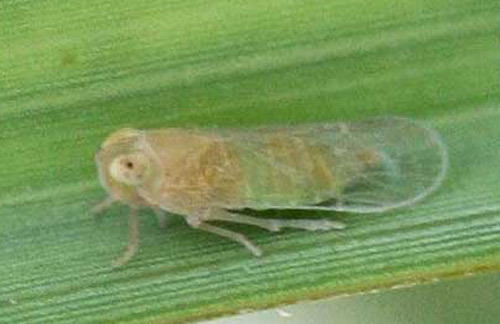 The nymphs of Myndus crudus develop in the root zone of grasses. They are present at the soil surface, often beneath small clumps of leaf litter and other organic matter, and to a depth of 3 cm. Moist sites are more favorable for the development of the nymphs than drier sites, and sites with host grass of relatively long length support greater numbers of nymphs than where the grass is mowed frequently to a short length. Upon maturing to the adult stage, the insects fly to palm foliage, where they feed and mate. The adults feed on palm foliage, inserting their stylets into leaf tissue and sucking plant juices. As in fulgoroids with general, they tend to feed on phloem. The females return to grasses to lay eggs. The adults are diurnal and nocturnal. The eyes of adults are light/dark adapted. Movements of pigments within the compound eye in response to changing light conditions are seen as changes in eye color. They are maroon-colored when adapted to darkness and turn straw-colored in response to increased light. The change takes place in about 15 to 60 minutes depending on several factors. Thus, at night or in the early morning, the eyes of most individuals are maroon-colored. As light intensity increases during the day, most have light-colored eyes. But Myndus crudus with dark-adapted eyes can sometimes be seen during daylight hours on deeply overcast days, or when an insect has been resting in a darkened site. Following the discovery of this adaptation in the eye of Myndus crudus, it was later described in additional species of Hemiptera. Figure 11. American palm cixiid, Myndus crudus Van Duzee, with light-adapted eyes. Photograph by F.W. Howard, University of Florida. Figure 12. American palm cixiid, Myndus crudus Van Duzee, with dark-adapted eyes. Photograph by F.W. Howard, University of Florida. Research using several approaches, including field observations of the insects on different plants, radioactive tagging of palms, examination of stylet tracks of Myndus crudus in leaf tissue, and molecular analyses, indicates Myndus crudus adults feed on the foliage of many palm species. No conclusive data on its preferences among different species of palms exist, but relatively high numbers of Myndus crudus are consistently observed on certain palm species, e.g., coconut palm, Manila palm (Andonidia merrillii (Beccari) Beccari), and Mexican fan palm (Washingtonia robusta H. Wendland). Conversely, Myndus crudus is rarely observed on certain other palm species, e.g., Cuban royal palm (Roystonea regia (Kunth) O. F. Cook) and yellow-cane palm (Dypsis lutescens (H. Wendland) Beentje & J. Dransfield). Myndus crudus is also commonly seen resting and presumably feeding on some arborescent monocotyledonous plants other than palms, such as common screw-pine (Pandanus utilis Bory). Interestingly, cases of LY have been diagnosed in Pandanus utilis. Myndus crudus has been collected from almost all of the species of palms in Florida that are susceptible to LY, the exceptions being mostly rare palm species that have not been adequately examined. Many of the species that are attractive to Myndus crudus are not susceptible to LY. It can be surmised that in these cases either the insect does not feed on the palm, feeds but does not transmit the pathogen, or the pathogen is transmitted but does not induce the disease. The nymphs have been reared for research studies on the roots of many different species of grasses, including species cultivated as turf or forage. There is great variability in the suitability of different species of grasses as hosts of Myndus crudus. 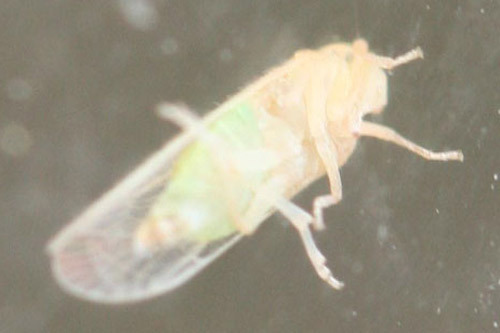 Some species are highly favorable to the development of the nymphs, while other species are poor developmental hosts of this insect or do not serve as hosts. St. Augustine grass (Stenotaphrum secundatum (Walter) Kuntz) is one of several highly favorable host species. The popularity of this turf grass in southeastern Florida may have been a factor in promoting dense populations of Myndus crudus in this region during the epidemic of LY in the 1970s and 1980s. This grass species remains the principal turf grass of this region, but the incidence of both LY and of Myndus crudus have subsided in recent years for unexplained reasons. Similarly, Guinea grass (Panicum maximum Jacquin), a favorable host and the most widespread grass in coconut plantations in Jamaica, may have contributed to the development of high populations of Myndus crudus during the LY epidemic there in the 1950s through the 1980s. Based on research at the University of Florida's Fort Lauderdale Research and Education Center, Myndus crudus is a vector of LY disease of palms. As the name implies, "lethal yellowing" is lethal to nearly all of the palms it infects. The disease is caused by a kind of plant-inhabiting bacterium called a phytoplasma. "Yellows diseases" of plants are generally associated with phytoplasmas, which are transmitted by insect vectors, especially planthoppers and their taxonomic relatives. Lethal yellowing is a palm disease that was known by different names in several Caribbean countries for more than 100 years. In the 1800s, the disease seems to have been most prevalent in Cuba, and repeated epidemics have devastated that island's coconut industry. In Jamaica it was endemic in the west in the late 1800s, but spread from there and became epidemic in the 1960s, ultimately spreading throughout the entire island and killing an estimated four million coconut palms by the 1980s. It was reported early in the 20th century in Hispaniola and some islands of the Bahamas. 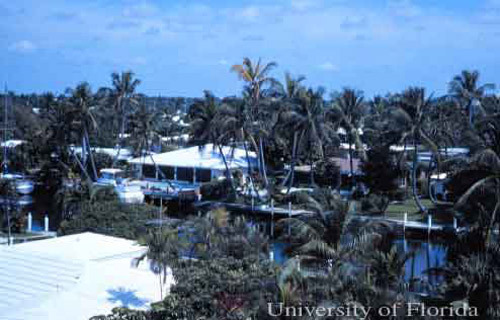 Lethal yellowing was diagnosed in coconut palms in Key West, Florida, in the 1950s and in Miami on the Florida mainland in 1971, from where it spread throughout the southeast coast of the peninsula. By 1983, it had killed about 300,000 of perhaps 1 to 1.5 million coconut palms, as well as thousands of other palm species. The epidemic began to subside in most areas of southeastern Florida in the late 1980s, but cases of LY continue to occur in this region. In the late 1980s, LY was reported near Fort Myers on the southwest coast of Florida. From there the disease spread to Florida's west coast, but the extent and level of destruction has been somewhat less than on the southeast coast. Figure 13. The distribution of lethal yellowing of palms as of September 2006. Map by Jane Medley, University of Florida. Figure 14. The first case of lethal yellowing (center of photo) in a neighborhood of Fort Lauderdale, Florida, 1976. Photograph by F.W. Howard, University of Florida. Figure 15. 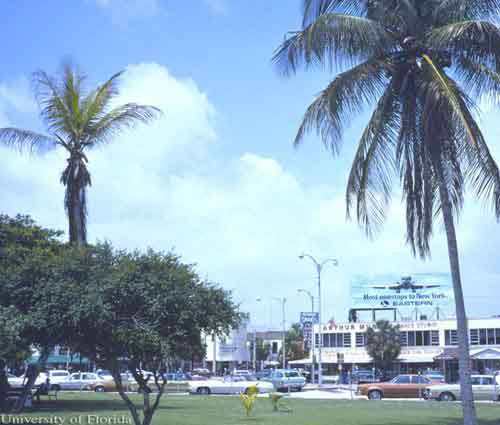 A coconut palm, Cocos nucifera L. (left in photo) dying of lethal yellowing in Hollywood, Florida, 1977. Photograph by F.W. Howard, University of Florida. Figure 16. 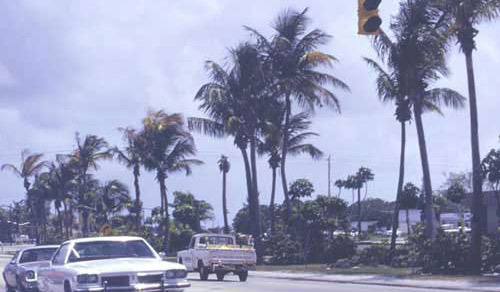 Coconut palms, Cocos nucifera L., in a street planting along US Highway # 1, Lake Worth, Florida, 1988. The trunk of a palm killed by lethal yellowing and a palm with early symptoms are visible, and many palms in this general vicinity were dead or infected with lethal yellowing at this time. Photograph by F.W. Howard, University of Florida. Figure 17. 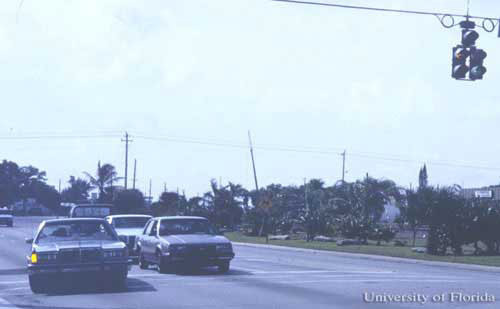 Same stretch of US Highway # 1 shown in photo labeled "lethal yellowing early effects" several years after lethal yellowing had eliminated coconut palms, Cocos nucifera L. Photograph by F.W. Howard, University of Florida. 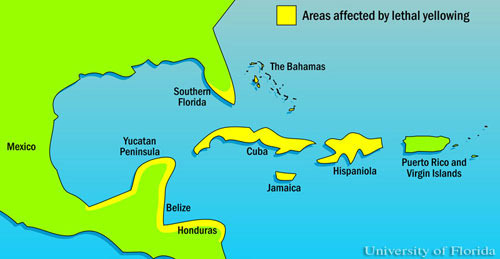 Florida was the only locality on the mainland of the Americas affected by LY until the early 1980s, when it was reported in Quintana Roo, Mexico. It has since practically eliminated coconut palms from the Caribbean Coast of most of southern Mexico and much of Central America, causing a serious impact on the agricultural economies of this region. Figure 18. 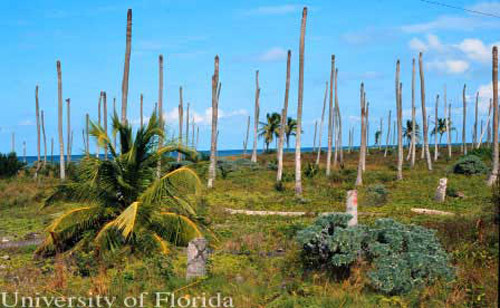 Dead trunks of coconut palm, Cocos nucifera L., remain on the north coast of Yucatan, Mexico, in 1993, following the destruction of plantations by lethal yellowing during the previous decade. Photograph by F.W. Howard, University of Florida. 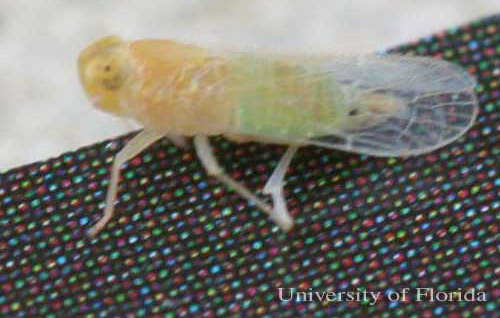 Although it is sometimes suggested that additional species of insects may transmit LY, researchers have found no evidence to support this theory. 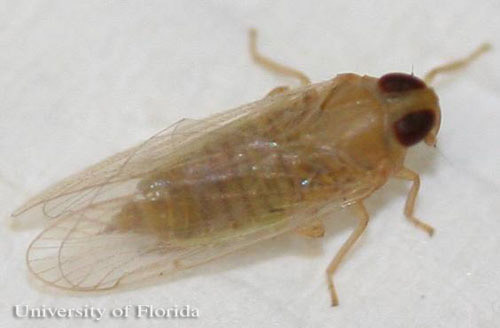 Transmission experiments have successfully shown this insect to be a vector in Florida, where conditions for conducting these experiments were especially favorable, but Myndus crudus is most probably a vector in all countries of tropical America where LY is present. It is also recognized, however, that insect diversity tends to increase relative to decreasing latitude, and indeed there are more species of auchenorrhynchous insects on palms in the tropics than in Florida. Little is known concerning the biology and vector potential of most of these species. Lethal yellowing infects and kills at least 36 species of palms. These include the economically important coconut palm and date palm (Phoenix dactylifera L.), as well as many palms that are important as ornamentals or as local sources of food or fiber in tropical countries. 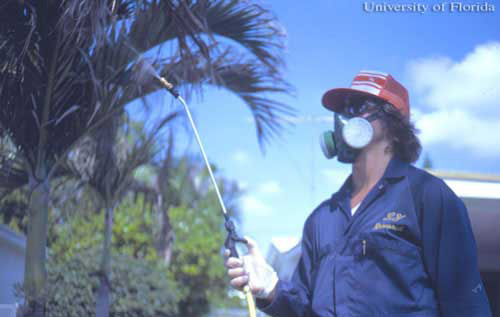 In southern Florida, hundreds of thousands of palms were killed by this disease during the epidemic of the 1970s through the 1980s, identifying LY as one of the most destructive diseases affecting the landscape in the history of the United States, along with such notorious tree diseases as Dutch elm disease, beech bark disease, and chestnut blight. Lethal yellowing has been most intensely studied as a disease of coconut palm because of that species economic importance. In fact, the coconut palm is considered one of the 20 most important crop plants in the world, and is a basic element in the agricultural economies of many tropical countries, as well as a source of important products in the world economy. Coconut palm is also one of the most important palms for aesthetic enhancement in southern Florida and in many tropical countries. Figure 19. Coconut palms, Cocos nucifera L. along the coast of Dominica, West Indies. This palm species is an important element in tropical coastal landscapes. Photograph by F.W. Howard, University of Florida. There are several other diseases of coconut palm present outside of the Caribbean region that were formerly thought to be identical to LY of the Caribbean, and thus were referred to as LY. 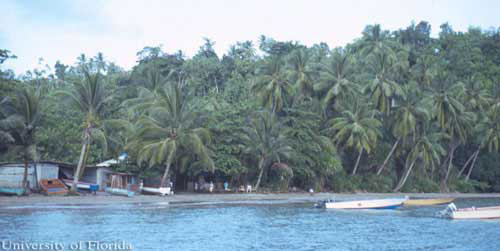 But LY is currently recognized as a distinct disease of palms in the Caribbean region. Similar diseases, most of which attack coconut palms in various parts of Africa, are currently known by other names. Theoretically, the rate of infection of insect-borne diseases is proportional to the population and activity of the vectors of the disease agent, thus, the spread of diseases can be reduced by controlling their vectors. Once Myndus crudus was implicated as a vector of LY, interest turned to the possibilities of managing this insect to bring about a corresponding reduction in the spread of LY. The prospects for controlling LY via biological control of the vector are not promising. The insect is native to Florida and the Caribbean, and is already under a degree of natural control. Several natural enemies of Myndus crudus have been identified, but these do not appear to reduce the populations of this insect sufficiently to significantly reduce the spread of LY. In an 18-monthlong experiment, biweekly applications of an insecticide on susceptible palms’ foliage slightly reduced the incidence of LY, but it was concluded that chemical control of Myndus crudus was not a feasible method of reducing the spread of LY over large areas for long periods. Insecticide treatments of palms and grasses have been used as quarantine treatments to attempt to prevent Myndus crudus from being transported to new localities. Figure 20. Foliar application of insecticide to a palm in an experiment to test the effects of chemical control of Myndus crudus Van Duzee on the spread of lethal yellowing. Photograph by F.W. Howard, University of Florida. Based on experiments, populations of Myndus crudus can be reduced by planting ground covers that do not support development of the immature stages. Various grass species suitable as ground-cover in coconut plantations have been shown to be poor hosts or non-hosts of the immature stages of Myndus crudus. Certain legumes, e.g., tropical-kudzu, Pueraria phaseoloides (Roxburgh) Bentham, and perennial peanut, Arachis pintoi Krapov & W. C. Gregory, have been shown experimentally to not support the development of the immature stages of Myndus crudus. 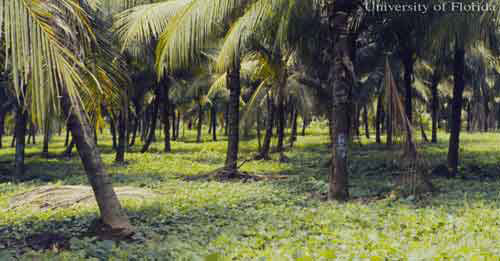 The latter species are used as ground cover in coconut plantations for soil improvement and erosion control. Their negative impact on the suitability of the environment for Myndus crudus may be an additional advantage. This would reduce the potential for transmission of LY, and where LY-resistant palms are planted would reduce the disease pressure on the palms, thus delaying the development of a strain of the pathogen that can overcome the defenses of the resistant palm. This prospective method of managing LY has been investigated in experiments in small research systems, but not on farms or other large areas. Figure 21. Perennial peanut, Arachis pintoi Krapov & W. C. Gregory, as a ground cover at the Fort Lauderdale Research & Education Center. Photograph by F.W. Howard, University of Florida. Figure 22. Tropical-kudzu, Pueraria phaseoloides (Roxburgh) Bentham, as a ground cover at Hacienda Victoria, Guápiles, Costa Rica. Photograph by F.W. Howard, University of Florida. During the 1970s-1980s LY epidemic in Florida, researchers noticed the disease tended to spread fastest on golf courses and other areas with intense horticultural maintenance. Tentative explanations for this were that the higher levels of irrigation and fertilization may have (1) supported higher insect vector populations, (2) resulted in a physiological condition that increased the palms' susceptibility to the disease, or (3) promoted both vector populations and LY susceptibility of the palms. In contrast, LY spread more slowly through plantings of coconut palms on seaside beaches and on paved automobile parking areas. This observation seemed compatible with any of the tentative explanations above. However, it was additionally considered that the relatively higher rate of survival of coconut palms on beaches and paved areas might be related to the lack of grass, which in turn would reduce the vector populations. Effects of salt spray, wind patterns, and albedo (i.e., reflectivity of solar radiation from sand or pavement) have been suggested as constituting the "beach factor". An experiment to compare Myndus crudus populations on palms growing in sand and in grassy areas was inconclusive. In summary, observations suggest that in areas where LY is present, excessive irrigation and application of fertilizer may result in a higher incidence of the disease. The relatively slow spread of LY on sandy beaches and other grassless areas compared to nearby grassy areas may be due to differences in the ability of the habitats to support the development of the disease vector. Figure 23. 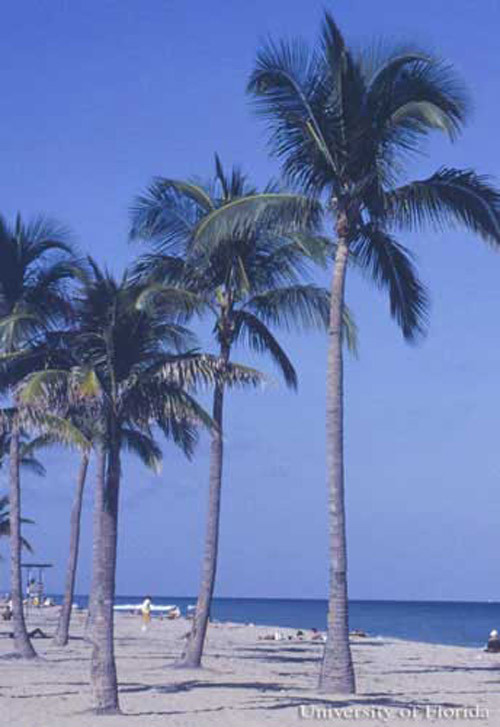 Coconut palms, Cocos nucifera L., on Fort Lauderdale Beach, Florida. Lethal yellowing generally spreads more slowly on beaches than on grassy areas. Photograph by F.W. Howard, University of Florida. Howard FW, Moore D, Giblin-Davis R, Abad R. 2001. Insects on Palms. CABI Publications, Wallingford, UK, 400 pp. Kramer JP. 1979. 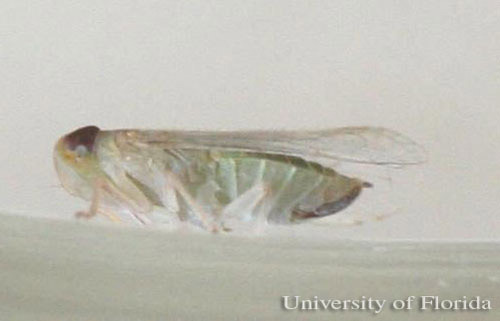 Taxonomic study of the planthopper genus Myndus in the Americas (Homoptera: Fulgoroidea: Cixiidae). Transactions of the American Entomological Society 105: 301-389. Oropeza C, Howard FW, Ashburner GR (eds.). 1995. Lethal Yellowing: Research and Practical Aspects. Kluwer Academic Publishers, Dordrecht. 250 pp. Publication Date: September 2006. Latest Revision: November 2015. Reviewed October 2018.